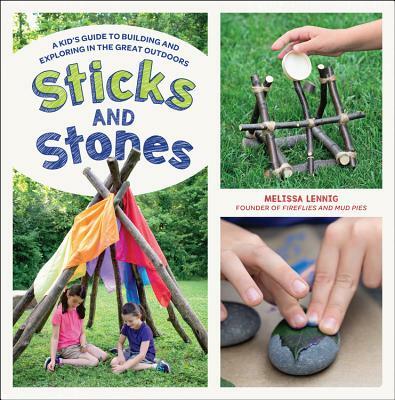 Sticks and Stones presents a treasure trove of building and engineering ideas for children to employ in the great outdoors using the materials made readily available to them, from cabins and tipis to bridges and dams. Many smaller scale projects are included, too—such as how to make ochre paint with shale, make a fishing pole, and carve a marshmallow roasting stick. Opportunities and materials for constructive play exist everywhere in nature. Author Melissa Lennig (of the blog Fireflies and Mud Pies) introduces today’s screen-overloaded kids to this world of fun waiting just outside the door. Whether camping or hanging out in the back yard, children will marvel at the wonderful, useful tools and playthings they can create with natural objects. Sticks and Stones details various designs for the ever-popular fort (cabins, tipis, survival shelters, etc.) and also covers structures such as bridges, fences, and dams, while explaining the STEAM principles behind each. In addition to structures, there are other ideas and projects for camping and the backyard, like a fire ring (explaining the types of fires, airflow, and safety), the always useful tripod, a travois, a rock garden, and toy boats. Along the way, there are multi-leveled reading opportunities in the form of quick features on considerations like mindfulness, campfire safety, mini STEAM design challenges, and more. Sticks and Stones is an essential resource for every junior outdoor adventurer.